Arsenic, a naturally occurring element found in bedrock, soil and groundwater across Iowa and, if ingested over a long period of time, is associated with increased risks of certain types of cancer and with diabetes and cardiovascular and neurological issues. In 2001, the Environmental Protection Agency adopted a new standard for arsenic in public drinking water supplies, decreasing it from 50 parts per billion to 10 parts per billion. However, the maximum contaminant level goal, the level at which no adverse health effects are expected, is 0 parts per billion. Because the water quality of private wells is unregulated, well owners are not required to treat their water to meet the EPA standard, but it is used as a guideline. In arsenic testing done by IowaWatch during summer 2016, no wells produced results higher than the maximum EPA public water standard. However, a handful showed detectible levels of arsenic at 2 or 3 parts per billion. “It’s good to know if you have it, so you can treat your water, reduce it, remove it,” said Pete Weyer, interim director of the University of Iowa Center for Health Effects of Environmental Contamination. Starting in July 2015, a state Grants to Counties program began including arsenic testing along with bacteria and nitrate testing. The tests, which are free to homeowners, are conducted by county sanitarians in participating counties. The change followed studies, including a statewide survey and a study in Cerro Gordo County, which showed arsenic to be more prevalent across Iowa than previously thought. Arsenic is frequently found in the north central region of Iowa. However, arsenic can be found in every major aquifer across the state. Because it is hard to predict where arsenic will occur, county sanitarians and officials with the University of Iowa State Hygienic Laboratory and others who spoke with IowaWatch suggested testing a well at least once for arsenic. In some cases, arsenic contamination can be a result of industrial or mining activities. Arsenic was also used in pesticides and wood preservatives, though the use of those chemicals is restricted today. However, in Iowa, experts who spoke with IowaWatch said the arsenic contamination found has been naturally occurring. Sophia Walsh, Cerro Gordo County’s environmental health specialist, said concerns about arsenic first started popping up in Cerro Gordo County in the early 2000s, when a public water supply showed high rates of arsenic, 540 parts per billion. Walsh said at the time the county tested other wells in the area to see if a pollution issue existed, something man-made leaching into the water supply. A small 2003 study showed the arsenic to be from natural sources, potentially linked to a specific aquifer and to pyrite shale in the bedrock, but there wasn’t enough funding to do a more thorough study. The county would perform a water test for arsenic if a homeowner requested it, she said, but wouldn’t continuously test. “We knew it was something that was being dealt with at least in that area of the county, but not necessarily throughout the county,” she said. Reporter Lauren Mills Shotwell spent 10 months doing research and testing rural well water quality in Iowa and learning how to conduct well water tests before deciding to focus on southwest Iowa. Working with five county sanitarians and interviewing several others and specialists she contacted rural residents whose drinking water came from private wells. Using Fund for Investigative Journalism grant money she tested 28 wells in May and June. The State Hygienic Lab at the University of Iowa analyzed the results. IowaWatch then shared the results with the residents willing to have their wells tested for this project. Shotwell, IowaWatch’s first paid full-time digital analyst/reporter, became news director of Little Village magazine in Iowa City in September 2016. During that time, from May 2006 through December 2008, the second phase of the Iowa Statewide Rural Well Water Survey by the University of Iowa Center for Health Effects of Environmental Contamination, was underway. The results published in 2009 found arsenic in 48 percent of the 473 private drinking water wells sampled across 89 counties. Eight percent of wells had levels of arsenic above the EPA’s standard for public water supplies. “The interesting thing is it doesn’t mean the entire county has high arsenic. In some counties, there might be a high arsenic well and in other parts of the same county we didn’t even find arsenic,” Weyer said. After receiving funding through the Centers for Disease Control and Prevention, Cerro Gordo County tested more than 50 private wells from July 2011 to June 2014 for arsenic. Each well was tested twice a year. Half of the county’s wells showed detectible levels of arsenic. One-third showed unsafe levels above the EPA drinking water standard. Researchers were able to point to higher likelihood of arsenic contamination in the Lime Creek Formation, an aquifer that includes pyrite and shale rocks and was frequently used by wells in the county. State Geologist Bob Libra said the location of the arsenic laden zone was key. Pumping a well causes the water level to go up and down, he said. And the worst arsenic leaching happens when the arsenic zone is in the area where the water level travels up and down, submerging it and then opening it up to air. “Oxygen does funny things when it gets into rocks. It can actually make the arsenic mobile. Otherwise, you might be pulling water from these rocks that have a fair amount of arsenic in them, but it will stay in them,” he said. Two types of arsenic exist: arsenic III and arsenic V. Most often, initial water tests, like those usually done by county sanitarians through the Grants to Counties program, determine total amounts of arsenic. Further testing can be done to determine how much of each type of arsenic is present. The type of arsenic is important for treatment, since arsenic III is more difficult to treat and can be remain in water if not treated properly. This IowaWatch story was republished by the Mason City Globe Gazette and Environmental Health News under IowaWatch’s mission of sharing stories with media partners. Walsh said the study resulted in increased awareness among people in Cerro Gordo County about the importance of testing wells. She said she more than 100 people already had signed up to get their wells tested through the Grants to Counties program, which started its new fiscal year July 1, 2016. 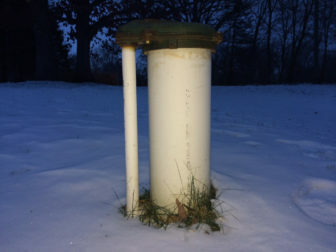 The study also led the county to update its well ordinances, requiring all new Cerro Gordo County wells to be drilled through the Lime Creek Formation and then cased, like a straw, so that they only pulled water from the aquifer below it, the Cedar Valley Group, which has a lower risk of arsenic contamination. The requirement previously had been created in 2007 but only covered 56 square miles of the county. All new wells in the county must be tested for arsenic. Six months after Iowa county sanitarians began testing for arsenic through the Grants to Counties program the state hygienic lab reviewed the testing results. Of the 490 tests performed, 189 showed a detectible arsenic level, at least 1 part per billion. Twenty-two tests had levels above the EPA standard, ranging from 10 to 62 parts per billion. Walsh said well owners who have a relatively a low arsenic level in their first test should retest every three to five years. If results from an arsenic test are close to the 10 parts per billion level and well owners choose not to treat their water, she suggested testing every year since the levels can vary slightly. “Arsenic is odorless, tasteless. You can’t see it. You don’t know if it’s there unless you test for it,” she said. Damn . My well tested at .09+ for arsenic . Sac County . Why isn’t help at the door ? Attention requested . Yes , water filtration is installed . But so curious to have such an extreme situation . How suffering am I ? I may have observed an artesian event in the grove near the house two years ago … seems to have subsided .